Up to 1,000 schools in England, including all those rated inadequate by Ofsted, will be turned into academies, under plans being published later. The Education and Adoption Bill will also scrap the requirement for academy sponsors to consult locally on whether they should take over schools. The aim is to "sweep away bureaucratic and legal loopholes", said Education Secretary Nicky Morgan. Labour said the "divisive" bill missed the challenges faced by schools. 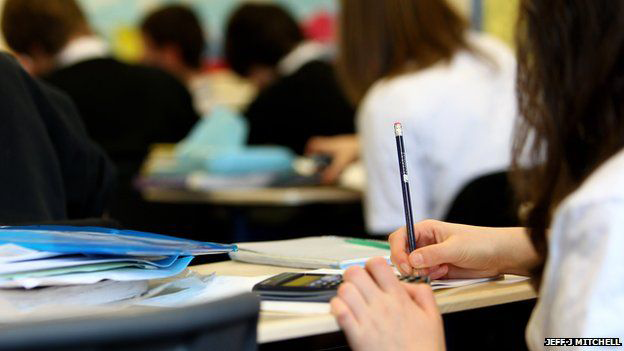 The government says campaigners have too often been able to delay or overrule the process by which schools deemed failing by Ofsted become academies. 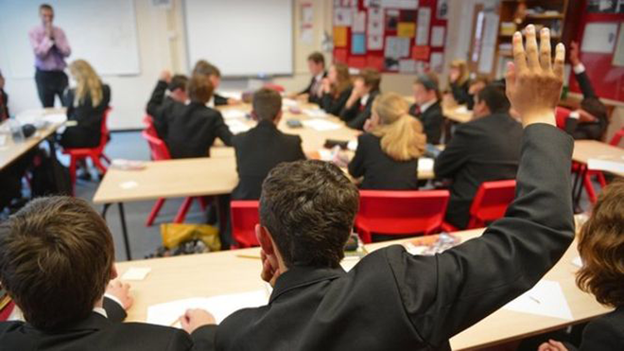 Ministers believe debates surrounding some attempts to impose academy status result in too many pupils "languishing in underperforming schools". The bill sets out measures to turn 100% of failing schools into academies, double the current rate. Academies are state-funded schools that are independently run by academy trusts or chains - charities that run a string of state schools. Sponsored academies are schools that have been "taken over" because they were not deemed to be doing well enough under local education authority influence. Although the schools are still managed in the same way, by a head teacher and the governing body, they are supported by the chain, which may provide a fresh impetus, direction and influence. This sidestepping of the local authority is seen by some as a form of privatisation, as the trusts are not directly accountable to the local electorate. Trusts and chains are not allowed to make a profit from running schools, which are inspected by Ofsted in the usual way. Currently, 235 schools are deemed to be failing, while 1,100 became sponsored academies over the course of the last Parliament. The government estimates up to 1,000 more schools will become academies by 2020, if the bill is passed. The bill will allow the best education experts to intervene "from the first day we spot failure", said Mrs Morgan. "It will sweep away the bureaucratic and legal loopholes previously exploited by those who put ideological objections above the best interests of children," she said. Mrs Morgan said hundreds of schools, often in disadvantaged areas, were already being turned around, "thanks to the help of strong academy sponsors". "This bill will allow them to do their job faster and more effectively, ensuring that thousands more pupils, from across the country, get the world class education they deserve." She told the BBC it was currently taking an average of 13 months to turn a school into an academy, and "a day spent in a failing school is a day too long when a child's education is at stake". Asked how many existing academies were deemed to be failing, Mrs Morgan did not give a number, but said there were "obviously academies that are not rated good or outstanding". "We already have the powers to intervene in the academies which are not making the required standard today," she added. Shadow education secretary Tristram Hunt said Labour had founded the academies programme and continued to support new leadership for failing schools, "be they academies or maintained schools". "But these measures do not meet the challenges we face in education, such as preventing educational inequality setting in during the early years and ensuring high-quality teachers are attracted into poorly performing areas. "It is very depressing to see the government's partisan and divisive education policy continuing into this parliament." Academy chain leaders welcomed the plan. Steve Lancashire, chief executive of REAch2, which from September will sponsor 51 schools across England, called it a "very positive step forward for families across the country. It will mean no child is left behind. "We welcome the opportunity that the bill will bring to engage with more schools, helping ensure that children get the first-class education they deserve." But Brian Lightman, leader of the Association of School and College Leaders, warned that taking over schools was not always a straightforward solution. Rapid and effective intervention was needed when a school was rated inadequate, said Mr Lightman. "In many cases academisation may be the best solution. However, in itself it is not a magic wand." National Association of Head Teachers leader Russell Hobby said the government had once again resorted to "sanctions and threats when our education system desperately needs investment and support". "Parents who have campaigned against the opaque and centralised process of academisation will be dismayed to see themselves dismissed as obstacles to be eliminated." Dr Mary Bousted, leader of the Association of Teachers and Lecturers, said there was no clear evidence academies improved standards. National Union of Teachers' leader Christine Blower called the pledge to convert up to 1,000 schools "as irrational as it is impractical". "Head teachers are already in short supply so the promise to sack more of them will simply exacerbate the problem," she said.